In this special episode of See Brian Write I gush about my love for National Novel Writing Month (NaNoWriMo). Season 2 of the podcast will be premiering in January 2014, but you can catch up on the first season over at soundcloud.com/seebrianwrite. SBW Podcast Update--Season 2 in 2014! As I start coming up for air from the whirlwind of a month that has been November, I wanted to give a quick update about the See Brian Write podcast. I mentioned on the last episode that I might do kind of a Season 1 / Season 2 thing, and that’s what I've decided to go ahead with. So, Season 2 of the See Brian Write podcast will be premiering in January 2014, with a bunch of new writer interviews, book recommendations, and of course, updates on my own projects. I may sneak in a quick episode in the next couple weeks, as I do want to gush a little about my love for NaNoWriMo, but we’ll see how that goes. So, if you’re a writer and are interested in being interviewed for the show, hit me up on Twitter @SeeBrianWrite. I’ve got three interviews tentatively lined up already, so there's about 9 or so spots available. Oh, I almost forgot--you can catch up on all of the episodes so far over at soundcloud.com/seebrianwrite. Enjoy! 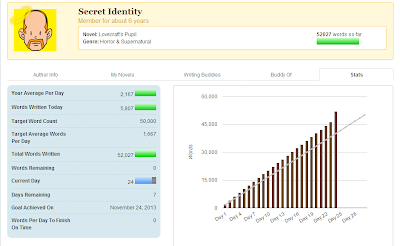 NaNoWriMo Diaries: Yo Adrian--I Did It! At approximately 5:30PM EST this evening, I crossed the 50,000-word mark on my NaNoWriMo project Lovecraft's Pupil, completing the challenge ahead of the November 30th deadline. And while that won't become official until tomorrow when I'll be able to validate my word count, it feels pretty darn good to have met my goal in a year that I was sure I did not have time to take up the challenge. And that's perhaps the biggest lesson I'll take away from this year's NaNoWriMo. Much like Jell-O, there's always room for writing. This month, I have gotten up at 5AM each day to write for an hour and a half before I start my regular day. This is a habit I plan on keeping long after November is over. I may not be putting out 2000 words a day, but starting my day by writing has been wonderful. Changes my whole daily outlook. 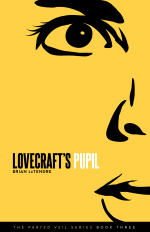 I would say I'm about eighty percent of the way through Lovecraft's Pupil, so my work in nowhere near done. And of course, there will be rewrites. 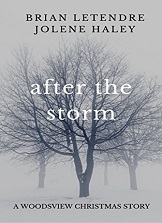 But I am beyond stoked to have the sequel to the book I just released almost drafted. I have ton of thoughts kicking around about this year's NaNoWriMo, and I hope to make a few more posts about it, but I will go out on this note: NaNoWriMo is amazing event. The sense of community alone is worth taking the challenge, and there's nothing like crossing the finish line when and seeing just how much you've accomplished. It’s a shame I don’t have time to blog more during National Novel Writig Month, because there are so many things I love about it. Without a doubt, the one lesson I am reminded of every single time I do NaNoWriMo or Camp NaNoWriMo is this--I need to put myself on a daily word count in order to write consistently. I have now accepted this as a scientific fact. With a full-time job, a wife and two children, three podcasts, and now coaching responsibilities, there is no way I will write every day without giving myself a word count. NaNoWriMo is great for me because it’s this external force that is telling me there are no excuses, that no matter how crazy my life is, I must write every day. 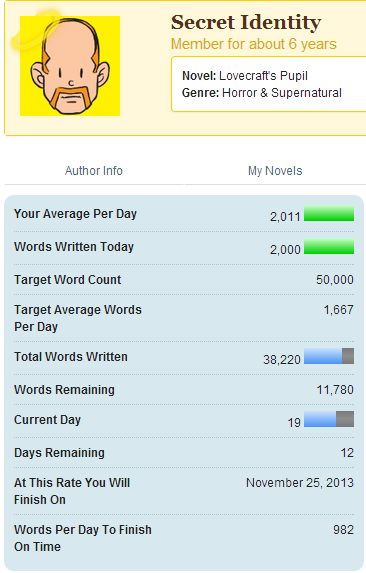 Now I’m not saying I need to be on the two thousand words a day pace I’m on right now, but I should at least be writing five hundred words a day outside of NaNo months. And the wonderful thing is that after writing so much during November, I have both a set routine and a huge amount of momentum to carry me into December and beyond. 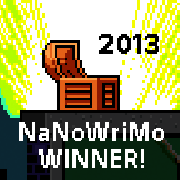 NaNoWriMo is a like a giant reset button for my writing practices, and that is just one of the many reasons I love it. And now, I must go back to writing about monsters, as I have a word count to hit. 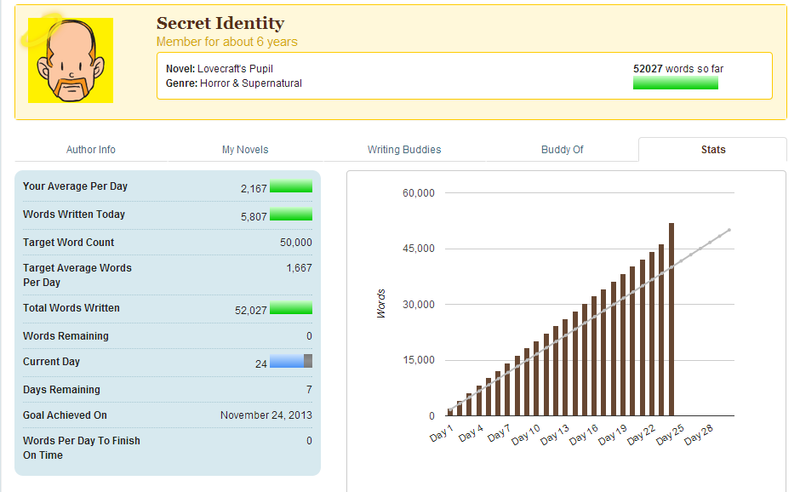 As I’ve mentioned previously, my NaNoWriMo project this month is the sequel to Lovecraft’s Curse. 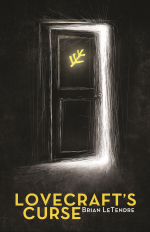 I knew when I wrote that book it was the beginning of the series, and the second full-length book that was set in the world of the Parted Veil (the first being Courting the King in Yellow). 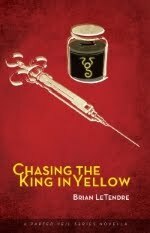 My goal was always to have Courting the King in Yellow and future stand alone stories exist in the same world as Lovecraft’s Curse, and intersect at points with that series. 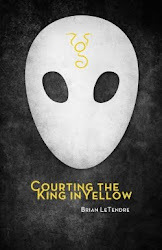 Well, almost as soon as I got into writing the sequel to Lovecraft’s Curse, I realized there was a very direct connection to Courting the King in Yellow. So, this book is actually becoming a direct sequel to both of those, although the cast of Lovecraft’s Curse will be front and center moving forward. The cool and at times very challenging thing about writing a horror/fantasy series is that it’s full of magic and monsters. That means I’m creating some sort of parameters around these things, and they need to be consistent between books. The way magic works in the world of the Parted Veil, for example. I’ve decided there are different types of magic in the world, and I’ve only really introduced a couple of them. I need to flesh out the rules for each type of magic, and then make sure I follow them. Working on the latest Parted Veil book as my NaNoWriMo project means a lot of the rules and systems I just mentioned are being developed on the fly. I’m taking what has been built in the first two books and elaborating on it. While that might sound like a nightmare, it actually feels pretty natural to me. 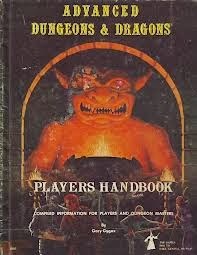 I grew up playing roleplaying games like Dungeons & Dragons, which in many ways are storytelling games. As someone who has run many a game, I’m used to telling a story as I go along, a skill that serves me well during NaNoWriMo. Not to mention, the goal of NaNoWriMo is to get the words out, and then clean them up later. I can always go back and fine tune the details altar, which is something I’m looking forward to. The D&D nerd in me can't wait to start tweaking those rules. 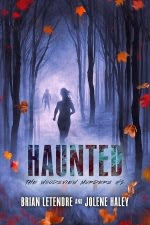 Check Out My Guest Post on Alana Abbott's Blog! 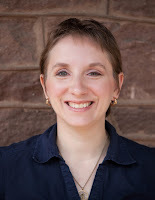 My good friend Alana Abbott, author of the fantastic fantasy books Into the Reach and Departure, let me guest on her blog this week! In my post, I blab about Lovecraft's Curse, but also about how Alana's writing inspired me to begin taking my writing seriously in the first place. When you're done, head over to the Flames Rising site and read the first chapter of Into the Reach, then grab it and Departure over on Drive Thru Fiction. Alana is currently working on the final book in the Redemption Trilogy, Regaining Home. 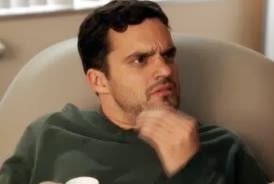 So, last night I was so excited about the return of Damon Wayans Jr. on New Girl that I couldn't wait to tweet about how hysterical the first five minutes were. Imagine my surprise when I got a message stating that my tweet hadn't been sent--because my account had been suspended. Just like that, I couldn't post anything new, nor could I even get updates from the people I follow. Completely perplexed, I followed the link's to Twitter's support page, where I was told that I could appeal my account suspension. I promptly did this, and received a message stating the my request to have my suspension reviewed was "in process." I read through the terms of service, rules and best practices several times, trying to think of anything I could have done to get my account suspended. I couldn't find anything. Worse, there is no one to talk to at Twitter, just a help desk you submit your appeal to. There was also no explanation in the confirmation email I received, either. That's right--I was given no reason whatsoever why my account had been suspended. But just like that, out of the blue, my Twitter access was revoked. Now, I get to wait for someone to review the situation, at which time they could decide to reinstate my account, or not to. So it's conceivable that I could have my account permanently closed for reasons completely unknown to me. Now, I'm assuming this is just some sort of mistake, and things will right themselves in the next day or two. But it is kind of scary how you can have your account suspended at any point without even an explanation. NaNoWriMo Diaries: From "I Can't Do NaNoWriMo" to "I Have to Do NaNoWriMo"
Last week at this time, I had completely talked myself out of doing National Novel Writing Month. I had just released Lovecraft's Curse, and I knew that November was going to be crazy for me already. There are changes afoot at my day job, and I coach my daughter's basketball team, which was starting the first weekend in November. Between that stuff and recording/editing/producing the Secret Identity podcast every week, I knew that I would have absolutely no time to do NaNoWriMo. 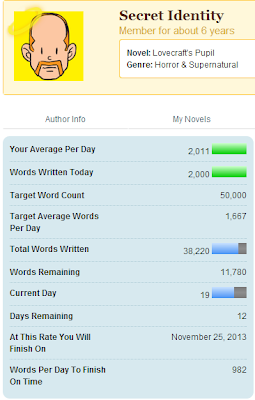 So of course, on October 30th I signed up for NaNoWriMo. Why? Because as I saw everyone on Twitter and Facebook gearing up for the big challenge, I started thinking about the pros and cons of NaNoWriMo. And the fact is there are so many pros, and the only con is the pressure I put on myself. The pressure of not actually hitting the 50,000-word mark. So because I was afraid of not being able to finish, I was going to miss out on all of the great stuff that NaNoWriMo brings. The amazing sense of community, of being a part of this wonderful writing challenge. the constant motivation from other writers, and great Twitter accounts like NaNoWordSprints. Or the knowledge that I am working on a writing project every single day, and I get to be immersed in that world for 30 days straight. Now don't get me wrong. I write all the time. There's always a project I'm working on. But rarely do get to dedicate 30 straight days to working on something, because the rest of my life takes precedence. With NaNoWrimo, I'm making a commitment to prioritizing writing every single day. 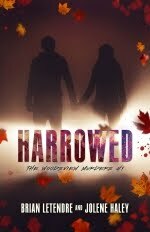 So, I am currently on day two of NaNoWriMo, and I am working on the sequel to Lovecraft's Curse. And it feels great. Whether or not I actually hit 50,000 words this month is less of a concern to me than in years past. I'm just glad to be back in this world, with these characters, creating new stories for readers to hopefully explore and enjoy.